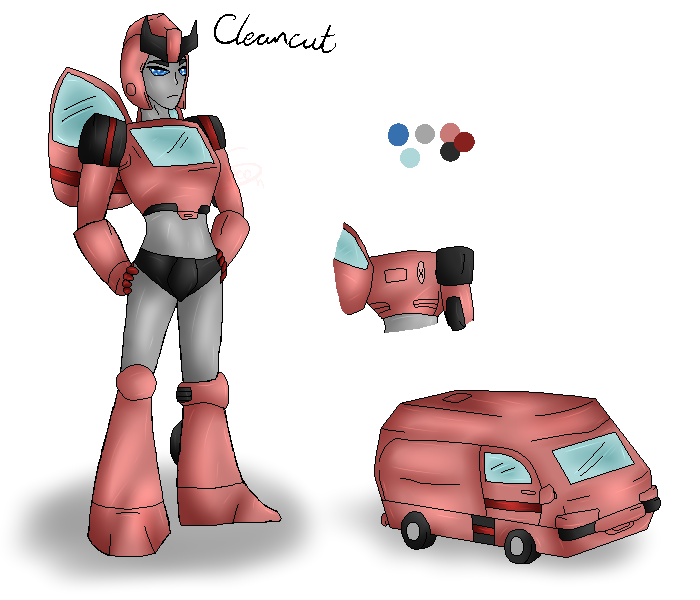 Cleancut projects the air of a calm, sweet nurse who will bandage up your wounds and weld you up while happily listening to either what happened or your troubles. You could easily be fooled by that at first. It doesn't take too long for other aspects of her personality to start shining through. She's a stubborn, sass-master with a competitive streak who can trash talk you into submission and if that doesn't work she has a secret well of absurd strength to physically break you. Her spark was kindled during unfortunate times and in an effort to keep her safe she was immediately placed into Cryostasis. It wasn't to happen as Ironhide and Ratchet died in what was known as, the assault on Autobot city. The appearance of Guiltaur and other younglings on the Autobot side ultimately saved her life. Her pod was damaged during a raid on the Ark-base and reviving her saved her from death. Knowing her parental units Optimus entrusted her care to Ultra Magnus knowing he would raise her right. She never knew her parental units but has heard many tales of them. She respects them dearly. Ultra Magnus raised her in their absence. She respects him but thinks he’s a massive softie and will defend him. After relinquishing his title of Prime Hot Rod still hangs around Magnus enough that Cleancut views him like a brother. A very immature, stupid brother, but her brother. She thinks he’s an idiot but will keep an optic on him. She follows the G1-story line. However, her world differs from canon a fair bit. Mainly as the episodes after the hate plague one do not occur. Nurse Joy with fists of fury.